Create memories to last a lifetime! 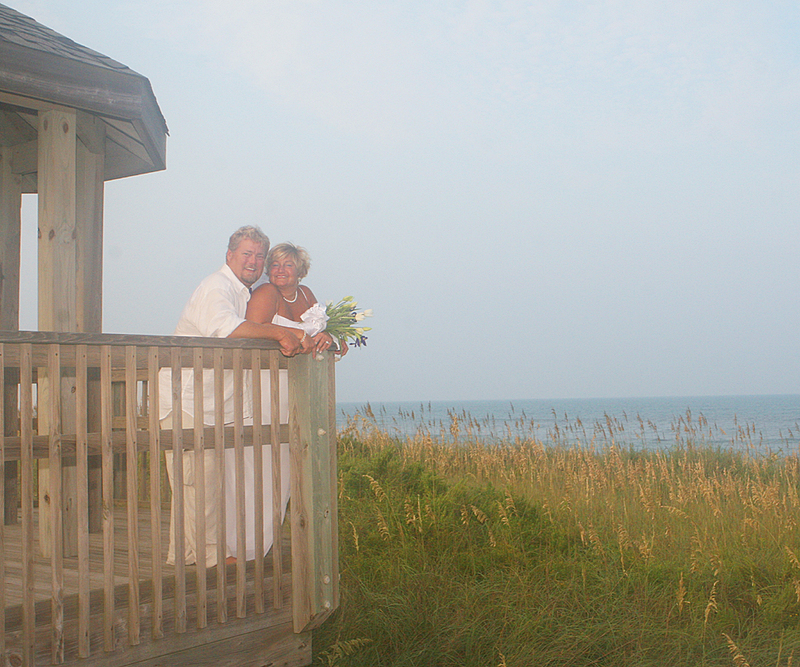 The clean, uncrowded beaches and sparkling blue ocean create a beautiful backdrop for destination weddings on Hatteras Island. We have compiled area information, attractions, things to do, driving directions, ideas and tips for an unforgettable island vacation full of fun, love and relaxation! 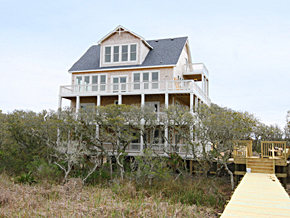 Still need to book your vacation home on Hatteras Island? No worries! 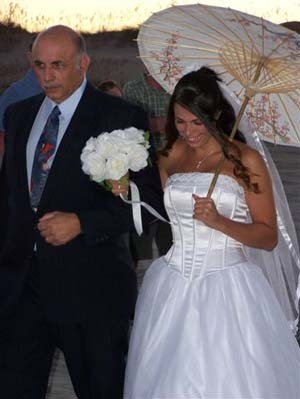 Call or email our Event Coordinator and let her know what wedding you are with. She is happy to help you find the perfect accommodations! Toll free (800) 237-1138 | rent@surforsound.com Now, on to the fun stuff! It doesn’t get any better than a week at the beach. Below are a list of local Hatteras Island activities and attractions that are perfect for just the bridal party, the groomsmen or the whole group all together! 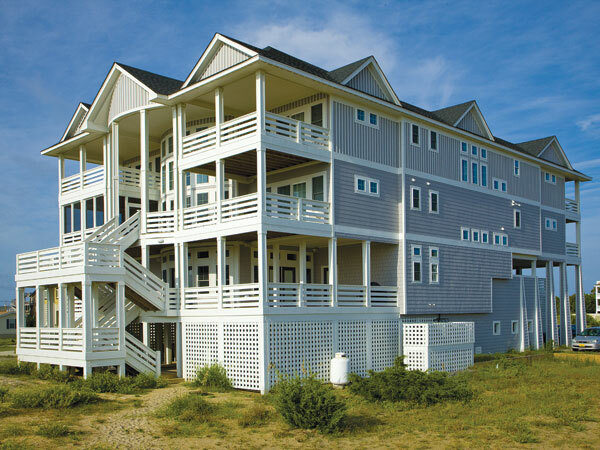 Hatteras Island offers a variety of cute boutiques, unique art galleries and more! Visit Indian Town Gallery with the girls for one of their sea glass wrapping workshops. You get to take a piece of authentic sea glass and make it into a custom piece of jewelry to keep. Classes and prices vary throughout the season, so please be sure to call ahead at (252)995-5181. The local surf shops, from REAL Watersports to Kitty Hawk Kites, offer a selection of men’s, women’s and kids’ clothing. Stop in for a cute summer dress, flip-flops, or matching sunglasses for the wedding party to sport in fun photos on the big day! Whether looking for pampering or painted nails, a visit to one of our area spas offers the perfect dose of relaxation and rejuvenation! The In Touch Massage and Wellness Center offers a selection of facials, body and foot massages and acupuncture as well as Jane Iredale Make up and Eminence organic skin care. Make your appointments today at (252)995-4067. Spa Koru, also on the island, is a spa, fitness center and salon, offering everything from massages to hair styling, manicures and pedicures. Okay, girls, we know you just wanna’ have fun! The latest water sport to make a splash on Hatteras Island is Stand Up Paddle boarding, more commonly called “SUP.” If surfing doesn’t sound like your thing, and body boarding the waves onto shore sounds like a wardrobe malfunction waiting to happen, then SUP is just the activity to get you comfortably out on the water! Stop in one of the locally-owned surf shops, like FOX Watersports, to rent the board and paddle and get a quick how-to lesson. It’s pretty simple, really fun and the views from the board are amazing! With close friends and family on the island for the big day, what a better chance to get the guys together and head out for an unforgettable day of fishing the gulf stream! For avid anglers or first time fishermen, it is really an awesome experience. Hatteras Island is known as the “billfish capital of the world” for the Blue Marlin, White Marlin and Sailfish caught offshore. Depending on the time of year, you will also catch colorful Mahi-Mahi, Wahoo, Tuna and Mackerel. Call Captain Jay with Bite Me Sportfishing and book your private charter today (252) 996-0295. Hatteras Island offshore fishing is a guaranteed good time for the guys! Check out these unique island activities for even more fun, sun and adventure! Try a Kayak Eco-Tour with Kitty Hawk Kites or rent a kayak from Ocean Atlantic Rentals and head out to explore the canals and waterways that lead to the beautiful Pamlico Sound. Many of the Day Use areas on the soundside of Highway 12 have pull-outs with parking and shallow areas to easily launch a kayak. Looking for a different perspective of Hatteras Island? Try Parasailing in the Pamlico Sound. Even if you prefer watching, rather than parasailing, it is still a fun adventure to head out on the boat together. Horseback Riding on the beach can be a fun group activity or, if you prefer, head out there with your significant other and enjoy a romantic guided ride on the beach! Equine Adventures can accommodate up to 10 riders per trip. Give them a call for more details and information (252)995-4897. They also offer photography options to capture the fun memories! Looking for something that everyone in the group can do? Head out on the Miss Hatteras Head Boat at Oden’s Dock for a Dolphin Cruise! The trips run Wednesday through Friday, 6 to 7 PM. Each trip accommodates 80 people and seats fill up fast! We hope you left your fear of heights at home, because seeing the island and ocean from the sky is one trip you will never forget! Outer Banks Air Tours offers a bird’s eye view of Hatteras Island so grab one or two friends and schedule your flight with Dwight Burrus today! If museums, history and mystery are more your speed, then you are in the right place! Hatteras Island is full of historical significance from the colonization of America, war battles at sea, shipwrecks, pirates and more! Celebrating, discovering and displaying our island’s rich maritime history, The Graveyard of the Atlantic Museum is located in Hatteras village just south of the ferry docks. The rough shoals off our coast made seafaring very dangerous for old sailing vessels and thus this became known as the “Graveyard of the Atlantic” due to the amount of shipwrecks. Admission is free to the public and donations are appreciated. Located in Rodanthe, the Chicamacomico Historical Association’s purpose is to restore, preserve and interpret the buildings and history of Chicamacomico Life-Saving Station, as well as the U.S. Life-Saving Service (USLSS) and its successor, the U.S. Coast Guard. This location has one of only two 1874 USLSS stations in the nation that are open to the public. The historical site offers programs in the summer from the filming of the “Nights in Rodanthe” movie to the mystery of the lost colony. The world’s tallest brick lighthouse, the Cape Hatteras Lighthouse is an iconic symbol of Hatteras Island. The lighthouse is open for climbing from the third Friday in April through Columbus Day and the view from the top is well worth the 248 steps to get there! If climbing the Cape Hatteras Lighthouse is not for you, the visit itself is still very memorable and offers a great location for photos! Also, full moon tours and evening climbs are offered on select nights. Drive your car onto the free ferry to neighboring Ocracoke Island, home to the second oldest operational lighthouse in the United States. Only 13 miles long, Ocracoke Island has a charming village with little shops and restaurants that can be easily explored on foot or by rental bike or golf cart. Stop in Howard’s Pub for a vast selection of beer, a good meal and a fun atmosphere! With close friends, family and loved ones together on vacation, it is the perfect time to get professional family photos at the beach, which make great holiday cards! Maybe the wedding photographer is available one day before or after the wedding. They will be so busy the day of the wedding that it is almost impossible to get every picture that you want and still have a great time with friends! Definitely take time to capture these special memories at the beach, you will be so glad you did! From maps to travel information, click the links below so you can easily find your way to fun! A Surf or Sound Realty vacation rental home can be a fabulous locale for a Hatteras Island wedding, rehearsal dinner, or reception. With all the amenities you’ll need for an exceptional event right at home, many couples find that rental home weddings are simpler and more laid back than the average wedding. Perhaps best of all, you can enjoy your home, and your vacation, long after the reception is over. Before you book your dream home, however, there are a few key questions and tips to bear in mind as you browse through our portfolio of vacation homes that allow weddings and special events. Think about the amenities you’ll need: Would it be convenient to have multiple wet bars or an elevator? 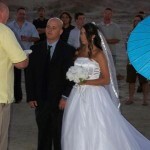 Do you need easy access to the beach for an oceanfront ceremony? Jot down a list of the amenities that would be the most beneficial, and use it as a guideline as you narrow your search. Think about benefits and restrictions: The joy of using a rental home for a wedding event is that it’s perfect for intimate wedding parties of a couple dozen family member and friends. 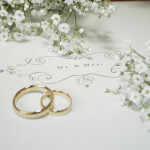 Wedding homes are not conducive, however, for large affairs with several hundred guests. If your island wedding is a grand scale celebration, look into local island sites that cater to large events, and simply book a vacation home to enjoy before and after the celebration. Think about accommodations for your guests: A benefit of having a wedding or reception at a vacation home is that many Surf or Sound Realty homes are grouped together in small communities and neighborhoods, making it easy for your guests to find accommodations for their visit. While booking your home, send an email or card to your guests letting them know where your vacation home is located, and allowing them to find appropriate lodgings nearby. Your guests can also call us at (800) 237-1138, and our vacation specialists will be happy to help them find the right rental home, near the ceremony or reception site, for their island stay. Think about a second week: Because the majority of vacation rental homes are Saturday to Saturday or Sunday to Sunday rentals, it might be a good idea to book two weeks, giving the wedding party plenty of time to prepare before the ceremony, and plenty of time to relax and enjoy their vacation afterwards. Above all else, consider what your dream wedding entails, and use that information to decide if a rental home is a good fit. If you’re planning an intimate island ceremony and reception that’s simple but tasteful, then a vacation rental home might just be the perfect fit. 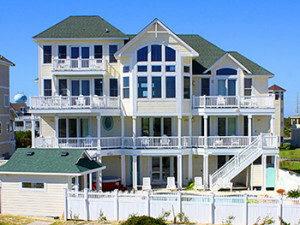 The Outer Banks Wedding Expo is being held January 10-11, and Surf or Sound Realty is delighted to be a part of the region’s largest wedding expo of 2009. 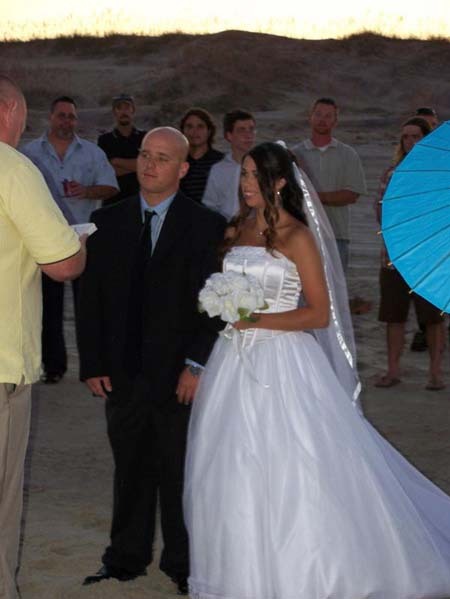 Surf or Sound Realty’s own Vanessa Gagliano, now Vanessa Paxton, makes a beautiful beach bride as she says her vows in the sand.